Cayenne peppers are natives of southern North America and northern South America. 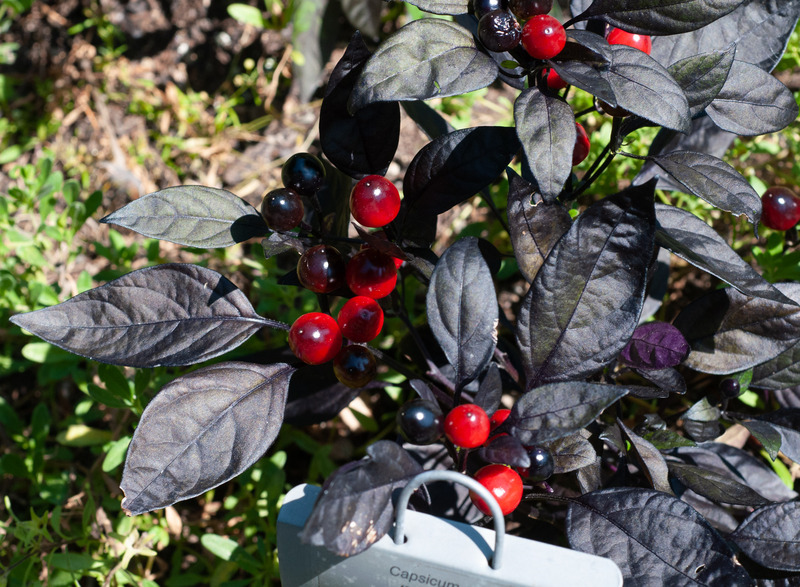 Most of the peppers we eat or grow as ornamentals are cultivated from this species, including anchos, banana peppers, cayennes, de árbols, guajillos, jalapeños, anaheims, Italian sweets, pasillas, peperoncinis, pimentos, poblanos, serranos, and tabascos. (A few, habaneros among them, have other origins.) 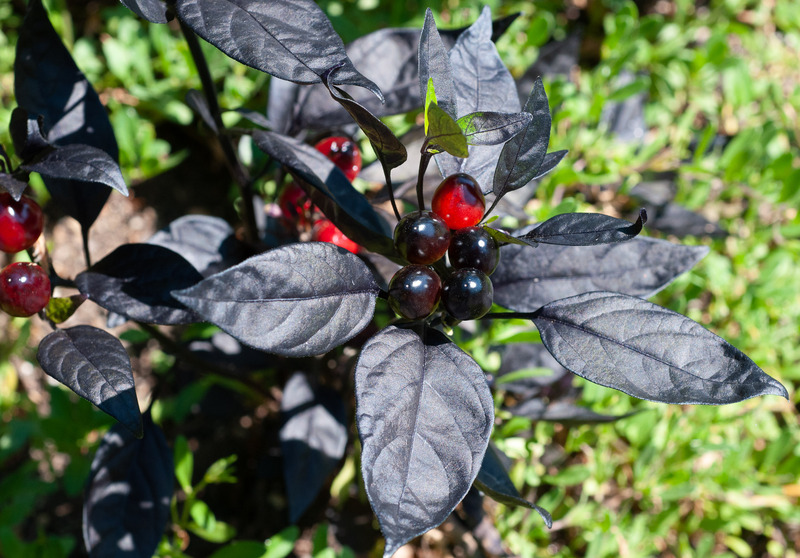 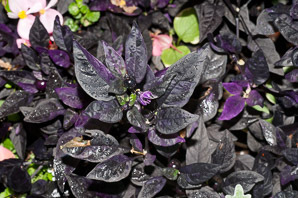 The ‘Black Pearl’ cultivar was developed by the U.S. National Arboretum, as an ornamental plant. 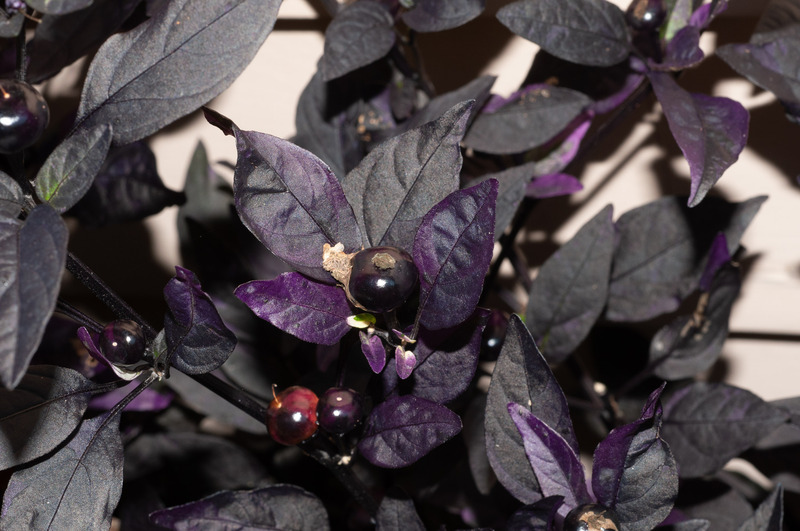 If you are curious as to the origins of cayenne peppers, consider Kraig Harris Kraft’s 2009 dissertation on the subject, The domestication of the chile pepper, Capsicum annuum: Genetic, ecological, and anthropogenic patterns of genetic diversity. Identification: Plants are up to 12" (30 cm) high (smaller than many), densely branched. 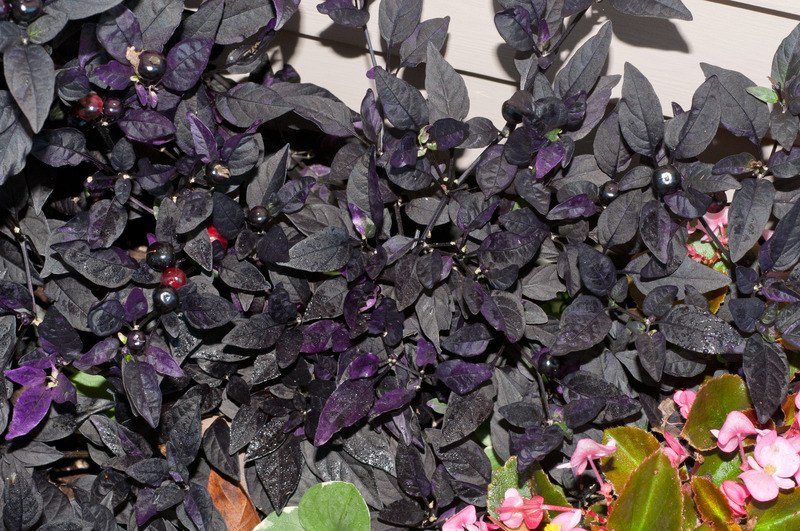 They are annuals in cooler climates and woody perennials in warmer ones. 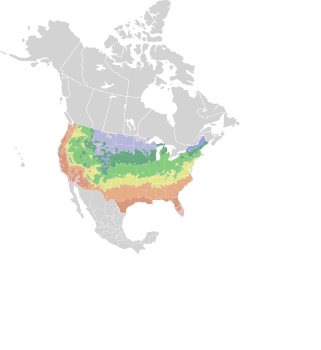 Leaves are oblong-ovate, ovate, or ovate-lanceolate, about 1-2" (2.5-5 cm) long, and black. 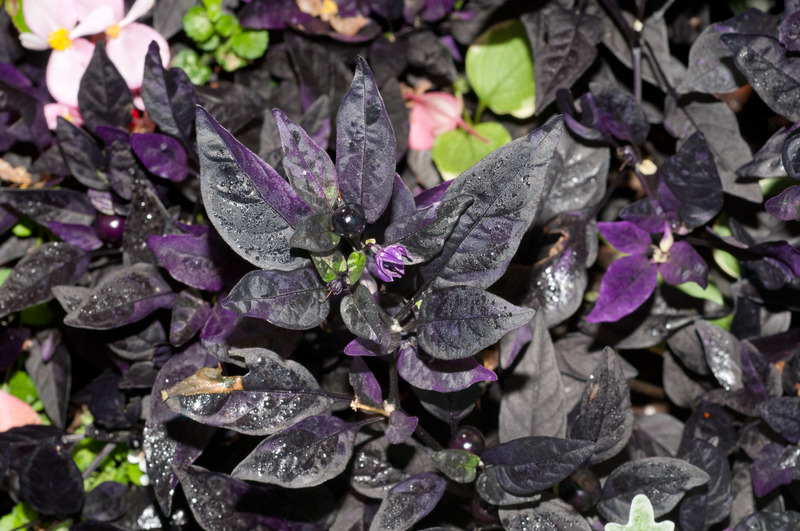 Flowers are purple (most cultivars have white flowers), about 1" (2.5 cm) in size, appearing from May to October. 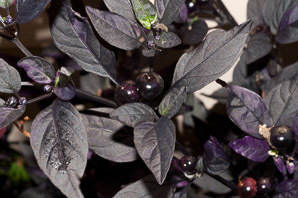 Fruits are shiny, oval in shape, ½-¾" (1.3-1.9 cm) around, and black (or red) (most cultivars are green, yellow, orange, or red). 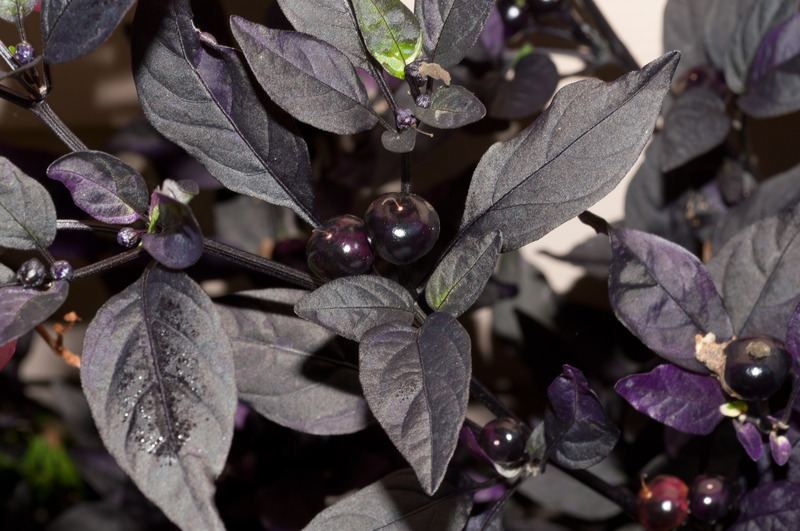 Capsicum annuum ‘Black Pearl’ description by Thomas H. Kent, last updated 2 Jan 2019.